Inside: Pancakes for breakfast, the best way to start the weekend. Outside: The blossom on the trees is so late this year and I am appreciating it all the more because it took so long to arrive. Inside: Finishing another crochet baby blanket as fast as my little fingers can. Outside: Visiting The Oldest Sweet Shop in England for pick & mix (Bella and Angus), liquorice gums (John) and for me a quarter of Coltsfoot Rock, which I buy at any opportunity it as it's so hard to find. Inside: And I ate them over the weekend, and enjoyed every crunchy, crumbly, sweet, aniseedy bite. Outside: Children + playground + sunshine = happy. Inside: The anemones bloomed and they are glorious. Ten days after I bought them they are still going strong, brightening up the house. Outside: Two walk in the woods, deep in conversation. Inside: The pasta pot bubbles and steams. We eat a lot of pasta. Outside: Hazy views of the Yorkshire Dales. Inside: Angus performs his daily check on the sunflower seed he brought home from nursery before Easter. The look on his face when it first pushed up through the earth! Pure, innocent joy and wonder. I think he thought he had to look after a pot of soil. Outside: Three explore the rocks. Inside: Huevos rancheros and pasta puttanesca. Outside: Stunning Brimham Rocks - I can never get over how the rocks just look so precarious - how do they not topple over?? Inside: The coffee table, the centre of the living room. Magazines, cups of tea and coffee, books, flowers, tv remote control - it's all here, but rarely this tidy. Outside: It's like Where's Wally but you have to find the robin instead. Sixteen photos from the last 48 hours. I had high hopes for this weekend. The stars aligned; Friday was payday, it was John's weekend off, the sun was going to shine...all good! And good it was, the first warm(ish) weekend of the year. I was desperate to get out of Leeds on Saturday and luckily so was John, so we headed to the Yorkshire Dales to enjoy the sunshine. I made him drive so I could crochet in the car. We spent a very happy day with no agenda or schedule, and went to Pateley Bridge first and then to Brimham Rocks. Today we all went swimming, ate pizza for lunch, washed the car, pottered in the garden, did some chores. It was a happy balance of busy and rest, of time inside and time outside. I hope you enjoyed your weekend as much as I did mine. That was a lovely way to spend the weekend. I guessed before I got to the end about Pately Bridge and Brimham Rocks. I actually have a picture of said rocks as my desktop photo at the moment. My anemones are up despite the dry summer. Lovely pics altogether. I must invest in a better camera. That sounds like a really wonderful weekend. What a difference some spring sunshine makes. The countryside where you are looks beautiful, thank you for sharing. Look wonderful Gillian. Ooooh Colts foot rock....I was only thinking about that when we found some colts foot flowers in the woods last week... haven't had any since I was a child...must look out for it. Those are beautiful pictures. I really enjoyed them. What a difference some sunshine makes! Those pancakes look delicious as did your risotto in the previous post. Love the old sweet shop - wonder has it been a sweet shop all that time. What a wonderful weekend you've had. I can't believe you've packed so much into it, even down to crocheting in the car, all hail superwoman! I love old fashioned sweet shops especially if they have 'little old lady sweets' aka rose and violet creams. I followed the link to the shop and they have them at No5 in their top ten! This sounds like my kind of place. I've never heard of coltsfoot rock but it sounds delicious. I am going to have to see if I can work out how I can end up 'happening to be passing' this shop the next time I head to the Peak District...tricky but I might just manage it! Such lovely photos of your weekend! So glad it was warm and sunny! The pancakes look delicious...that's what we had for breakfast this morning! The anemones are gorgeous! I am not familiar with them, but they are just so pretty! Love the kitchen shot...very cozy! And we like pasta, too! Your living room looks so pretty and inviting! I love your candleholder! Where is it from? I would love one like that so I could easily take it from room to room. Gillian, your weekend seems wonderful! The oldest sweets shop! Oh my! And the Yorkshire Dales are beautiful. And thanks (Angus) for reminding about the sunflowers! I planned to plant them today and almost forgot. Beautiful photos, beautiful week-end! Pancakes, sun, sweets, happy children at the playground and beautiful countryside.. perfect! Hi There, It sounds like you had a perfect week-end!!! Hope your week is going to be even better!!!! Anenomes are so beautiful. I have loads pushing up through the soil. This time last year they were already in flower. And I love the chilli photograph! You really should do a post on photo tips - your photos are always stunning. A lovely weekend for you all! Great post and photos. KP is growing some sunflowers from seeds as well. LIke the look of the oldest sweet shop. KP and the OH would be in heaven - they are very sweet toothed. Have a great week. A really lovely weekend full of family time, just what the weekends should be when your children as little. Lovely photos of simple happy things that make us all smile. That sounds like my kind of weekend (except for the chores). We love Brimham Rocks, especially for bilberry picking. What lovely photographs and tales of a great weekend. I love the inside/ outside concept. Very enjoyable reading. Thanks for sharing. The inside outside idea was great! Oh the pancakes looked yummy. 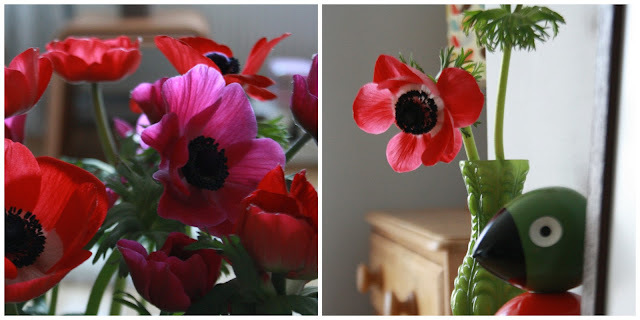 The anemones really did turn out beautiful. The Yorkshire Dales look so lovely in all the photographs I would like to visit there one day. A beautiful post and it sounds like a perfect weekend. I haven't been to Brimham Rocks yet but they've been on my 'list' for a while! I love coltsfoot rock, the health food shop in my local town sell it but I rarely think about it, I might have to pop in for some soon! I really love this post. It's a great way to share the weekend's events. The Brimham Rocks are so interesting; I've heard of them before and I would love to see them in person sometime. We eat a lot of pasta too, it's so easy and everyone loves it. I'm glad fresh basil season is here so I can start making sauces from scratch again. Oh, Coltsfoot sticks, haven't tasted those in years. My parents sold them in their shop, a bit bigger, though, than the ones you bought. Those pancakes look equally delish. Sounds just perfect, great pictures and that sweet shop is so cute! Hope you have a happy week also, lovely post. Gorgeous photos. The sweet shop looks lovely and the pancakes have made me hungry! ...and all so very much gorgeous. I love starting the weekend with pancakes - it kind of feels naughty and indulgent. Looks like a perfect weekend. Lovely post. I normall like a savoury breakfast but since I got pregnant, I have been craving sweets. Those pancakes look just perfect. This looks like an amazing weekend. I love this idea of "inside/outside" photographs! What a lovely post and a lovely weekend. Fabulous photos. "The anemones bloomed and they are glorious." WOW! They are still blooming great!